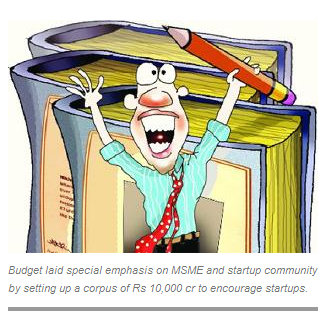 The Union Budget for 2014-15 laid special emphasis on the MSME and startup community. From setting up Fund of Funds with a corpus of Rs 10,000 crore to encourage startups to reviewing the definition of MSME, the Budget had it all. Charter Members from one of the biggest entrepreneurial body, TiE Delhi-NCR, and others in the startup ecosystem, spell out the hits and misses in this year’s budget. Amongst things I noticed, getting the Rs. 10,000 crore fund on the ground is clearly a great development. It is very smart to have built in leverage from private pools of capital in this fund, rather than making it 100 percent public money. Also, the assurance on retrospective taxation will help improve the investment confidence. The announcement of the Rs 10,000 crore fund for startups is very welcome. The UPA had announced a Rs. 5000 crore fund but failed on execution/implementation. We hope that this will not only remain an announcement but get executed quickly and be administered transparently and fairly. The service tax on online and mobile advertising, while keeping it exempt for print advertising is illogical. This will hurt small startups as they favour online advertising for their businesses. While announcement of rural broadband is welcome as it can offer new opportunities for startups and the budget recognizes startups and software product community, it falls short of embracing them as agents that will build the next $100 billion export industry in 10 years. The FM has to earn the creditability of this position as in past budgets a Rs.5000 crore “Indian Opportunity Fund” and another Rs.5000 crore “India Innovation Inclusive Fund” were announced. But they could never become a reality. This fund allocation is desired for a period of 7-12 years to build a large corporation from a startup. Any such fund does become self-sufficient within 10-years and hence, such budget allocation must be such ..
Subhrangshu Neogi, Director- Brand & Corporate Communications, Religare Enterprises Ltd. The budget this year is a strong statement of intent for growth and development. It has a strong inclusion and welfare focus but at the same time has avoided being populist and rightly so. Fiscal prudence will go hand in hand with strong triggers to propel the spirit of enterprise and development which is heartening to see.While the plan and roadmap looks good we will have to wait for the actual implementation as we move along. It is important to understand that the existing policy also had significant funds set aside for technology startups as well as others which were administered though a bunch of different schemes. However, the problem has always been the access to such funds which are concentrated with SIDBI, TDB and other bodies. These entities don’t necessarily have a solid methodology for evaluating startups beyond revenue and number of patents which might not always be the best metrics – also access to funds to funds is near impossible for start-up companies based in category B & C cities. One big bone of contention is the incubation and acceleration infrastructure – several dozen incubators and accelerators are already in place in various cities and new ones are coming up at a very fast rate. If the government truly wants to encourage incubation or accelerator, the best idea would be to allocate funds to existing incubators with a proven success record. Several of these work closely with the government’s Technology Development Board – (TDB), and are a better place to invest than spending inefficiently on setting up new facilities or acquiring land for incubation space. I welcome the Finance Minister’s move of allocating Rs. 10,000 crore to support the start-up ecosystem in India. A special focus on software start-ups will encourage entrepreneurship and product innovation, and reduce our reliance on the services sectors. Also, the government’s intention to revive SEZs and make them effective instruments of industrial production is a much needed move and will ensure better infrastructure for new set-ups. It is encouraging that this government is talking so much about entrepreneurship and has included startup thinking in its national budget. Rather than a few vague positive provisions, however, which many startups will never see and never benefit from, we require negative provisions that will impact all startups. This could take the form of tax exemptions and tax credits that all startups can avail of in the first three years of operations. The real question for social impact organizations will be how the government implements the Companies Act and its various CSR and social investment provisions. That will be in no speech, but in the actions of thousands of income tax officers and the chartered accountants working with them. In the government’s future full budget, we would like to see further deregulation of venture funds so that it is easier and less expensive to start a venture fund. That’s the right way to get Indian startups the capital they need. Educomp welcomes the Union Budget specifically in terms of allocations made towards skill development and online education. The Skill India programme is an encouraging signal indicating priority for a much needed thrust in this area. We also congratulate the Finance Minister for making a strong pitch for online education to bypass the limitations of access to schools. It is expected that both these thrust areas will receive incremental allocations in the budgets to follow and that these small beginnings in these critical areas will convert to a long term policy with budgetary allocations to match. The most-awaited Union Budget has undoubtedly come as a delight for some sections of the economy. Talking about the start-up SMEs, the fund amount of Rs 10,000 crores allocated to them is definitely a major highlight. Addressing their credit concerns in the country, the government has announced the formation of a Venture Capital. The Union Budget 2014 reflects optimism for the Indian SMEs in the coming year. With conducive financial schemes and budget allotments planned in their favour, SMEs are bound to make a substantial contribution to the country’s GDP. The efforts undertaken to promote entrepreneurship are truly a positive sign for the economy.